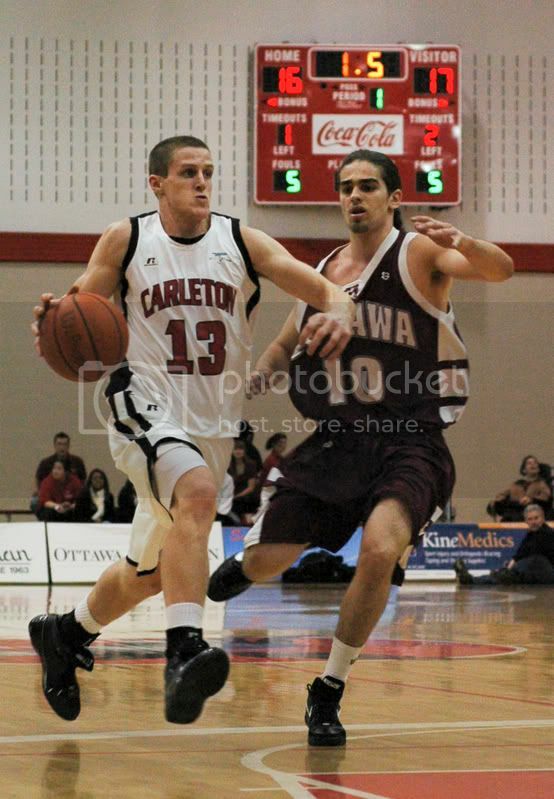 Carleton's tri-captain and fifth-year senior guard Stu Turnbull will be the OUA East candidate for the Mike Moser Trophy, edging out Ryerson big man Boris Bakovic and Ottawa's Josh Gibson-Bascombe, who plays the same two-guard spot for Ottawa. Turnbull was a good call if you go by the rule of thumb individual awards should be a byproduct of a team's accomplishment, which is a decent first principle to work from. The Kingston native is No. 1-ranked Carleton's leading scorer and outscored Gibson-Bascombe, 29-18 and 22-19, in the Ravens' season-series sweep of the Gee-Gees (heading into tonight's OUA East final). That's the end-of-story right there for many people. The statistical argument, going by the game scores which Rob Pettapiece compiled, provide at least a neat counter-point. People who have seen the Ravens play know how much Turnbull matters to them at each end of the floor. The Ottawa games were high-leverage and he came through in both cases (Rob adjusts based on team's RPI). Stats are a way to make a sense of the game from the outside looking in. The godfather himself, Bill James once said, "There are a lot of things that you just can't see from out here, folks. Dedication and leadership and desire and committment; I see glimpses of all that, but you just can't see those things clearly from the outside, and it's silly to pretend you can." Those making the selections saw in Turnbull, a team leader who's put up solid numbers across the board (16.7 points and 5.1 boards). He's a guard who can score from inside and outside, play physical defence, bring the ball up the floor and help on the boards, where Carleton almost doubled the next-best team in rebounding margin. MVP (and Moser Award finalist) — Turnbull, Carleton. Rookie of the year — York guard David Tyndale (Mississauga). Averaged 15.1 points in his first season, pretty decent. Top defender — Carleton guard Rob Saunders (Kingston, Ont.). Not a bad day for him and Turnbull, who have played in the same backcourt since they each learned to bounce a basketball. Ken Shields Award nominee — Ottawa centre Dax Dessureault (Embrun, Ont.). It's the second major award in two years for big Dax, who was a somewhat contentious selection for defensive player of the year last season over then-Carleton guard Ryan Bell. Coach of the year — Dave Smart, Carleton. First team — Bakovic, F, Ryerson (Toronto, Ont. ); Doornekamp, F, Carleton (Odessa, Ont. ), Dessureault, C, Ottawa; Turnbull, G, Carleton (Kingston, Ont. ); Gibson-Bascombe, G, Ottawa (Toronto). Matas Tirilis, F, Laurentian (Mississauga). Rookie team — Tyndale, G, York; John Lafontaine, G, York (Whitby, Ont. ), Josh Budd, G, Ryerson; Timmins, Ont. ); Kyle Smendziuk, F, Carleton (Kanata, Ont. ); Warren Ward, G, Ottawa (Brampton). Big Man on Campus has a confirmed list of OUA West award winners. That was covered off here previously, so just to add to that, here is the rookie team: Travis Berry, G, Laurier; Greg Carter, G, Lakehead (Ottawa); Scott Laws, G, McMaster; Didi Mukendi, G, Brock; Joel Whitty, G, Brock, Yoosrie Salhia, F, Lakehead. Boris is the BEST player in this country hands down! He helped double the team's win total from last season AND he made all his teammates better and believe they could win games. How can you give the award to some average Joe from the best team in the country when if you remove him they'll still win lots of games without him? 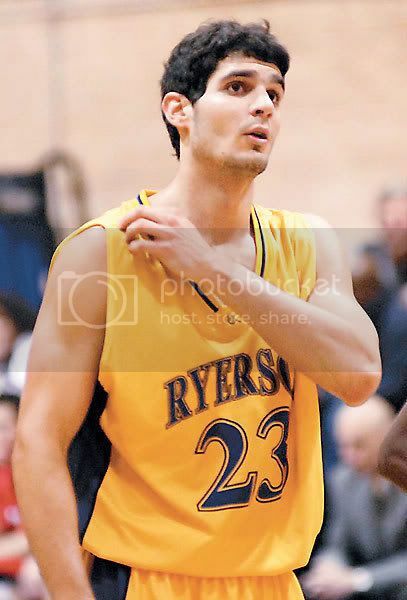 Take Boris off his team and see how many wins Ryerson gets without him! Maybe 2 (both against RMC) max. I thought MVP meant MOST VALUABLE PLAYER! That would be the player who is MOST VALUABLE to his team, no matter what the win total. It helps to be above .500 but MVP is what it is. I'd like to see Turnbull make the Canadian team and then drop double-doubles in FIBA play against Argentina & Turkey and then drop 20 pts on China AS A STARTER!!! Boris did this for the U-19 team and Suckwart Turnbull has done SQUAT, ZILCH, NADA! Boris owns Turnbull for life and the OUA can take their award and shove it up their A$$!! !